Turning Tides is a cross-agency partnership working together to do everything possible to improve the quality of bathing waters in North West England. Five years ago the partnership generated the LOVEmyBEACH campaign as a method to engage with the general public on how together, we can keep our local beaches and bathing waters clean. Although water quality at the beaches where people swim has improved dramatically over the last few decades we want to improve it further and that’s where you can help. Through five years of experience the partnership communications are well established across the region, so much so that we now look to assist further afield, driving national campaigns which will benefit not only the North West’s bathing waters but hundreds of designated bathing waters across the UK. The #binit4beaches campaign is the creation of the National Bathing Water Improvements Communications & Campaigns group. A collaboration which we set up with the Environment Agency and also includes Surfers Against Sewage, the Marine Conservation Society, Water UK and a whole range of groups who are working hard to keep the seas clean. 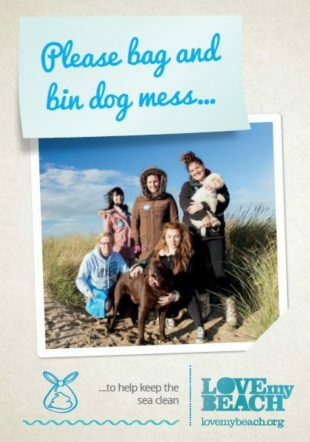 From 30th October until 5th November the group will generate an influx of social media activity containing the #binit4beaches hashtag raising awareness about the effect dog poo has on beaches. Hundreds of bags of dog poo were found on the UK’s beaches according to the Marine Conservations Society’s 2016 research; with 792 bags recorded at 364 beaches by volunteers over the Great British Beach Clean weekend in September last year. However these numbers don’t show the full scale of the problem; beach clean volunteers do not record unbagged waste therefore the total amount of dog poo left by some owners on our beautiful beaches remains unknown. 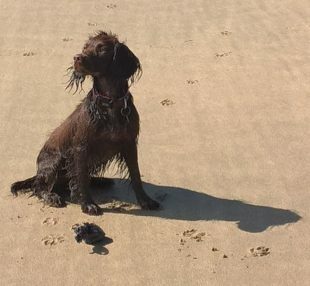 Many people believe that leaving dog poo on the beach is OK because the tide washes it away however this natural disposal technique isn’t the best thing for our beautiful beaches and seas. Bacteria present in dog poo is potentially harmful to beach users, paddlers and swimmers and can negatively affect water quality test results. Millions of people head to the UK’s beaches to relax, paddle and swim every year and we want water quality to be the best it can be. Last year 98.5% of the UK’s bathing waters met the tough minimum standards. If more people knew the small actions they could take then by working together, we can continue to help protect and improve water quality. So this week, please help us raise awareness about this topic by sharing a message on social media containing the #binit4beaches hashtag. And remember, if you visit the beach with your dog please bag and bin your dog poo, making the beach safe for everyone to enjoy.